This validation case is the result of the study of a working group of COFREND (French Confederation for Non-Destructive Testing). 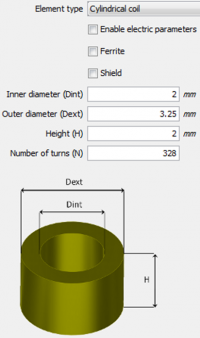 This group "modeling of Eddy currents" aims at proposing benchmarks gathering simulations and experiments results allowing the validation of Eddy currents simulation codes. The specificity of this benchmark lies on through flaws. The inspected specimen is a plate of 1.55 mm thickness, in inconel, conductivity of 1.02 MS.m-1 and relative permeability of 1. The probe is made out of a cylindrical coil at double function which geometrical properties are gathered on the figure below that shows the panel in CIVA allowing the definition of those properties. The acquisition is done on two channels at 100 kHz and 300 kHz, with 1 mA in injection and reception in absolute mode. 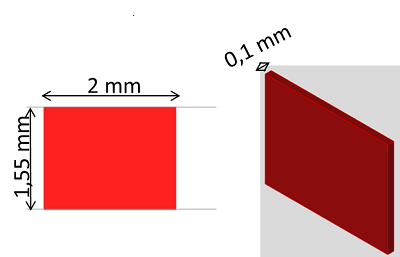 The defect present in the piece to inspect is a parallelepiped notch trhough the whole specimen thickness (figure below). 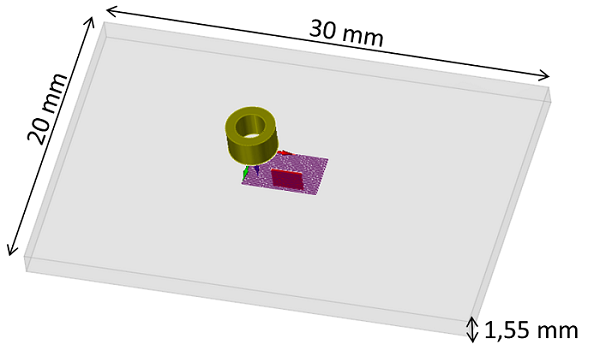 C-scans of imaginary parts obained with CIVA 2015 and the experiment are represented on figure below. Real and imaginary parts after the AA' cut drawn on C-scans above as a function of scanning for 100 kHz and 300 kHz frequencies are compared on figure below. A good agreement is observed between experiments and simulations. 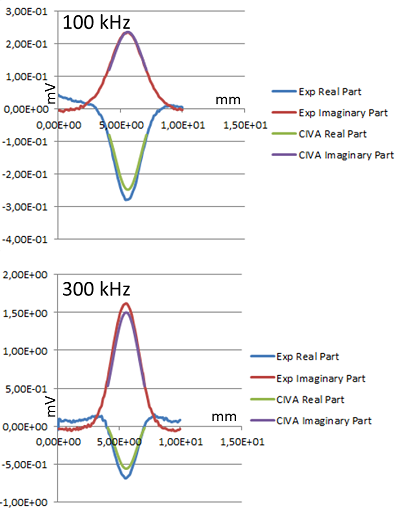 Comparison between experiment and simulation with CIVA 2015 for channels at 100 kHz and 300 kHz. CIVA simulation results were also compared with the results of two finite element codes: C3D, developed by LAMEL (joint laboratory between EDF R & D and the University of Lille) and Flux 3D, developed by Altair. The amplitude and phase differences are given in relation to the experimental results. The agreement is satisfactory between the 3 codes and the experiment with a difference less than 10% for all the cases. These results were presented in the article "Developing and using benchmarks for eddy current simulation codes validation to address industrial issues" at QNDE in 2010.